Try it and You May! : Go Ahead, Ask Me How Old I Am! Go Ahead, Ask Me How Old I Am! This summer I competed in three back-to-back triathlons. And at each competition I had to wear my age very publicly. A lot of women don't like to share their age, but a lot of women also don't like jumping into freezing cold rivers with squishy mud. I can't say I loved my recent river swim in my 2nd triathlon, but I did it. And I'm really proud I did! And I am also really proud that I'm 36 and don't wish I was 18 like some people think! When you do triathlons, you can't be bashful about things like age. Everyone knows yours and you know everyones' age. It's great because it helps you focus on your main competition. In regular 5Ks, runners don't wear their ages publicly, so you never know if the person breathing down your neck is going to knock out of the top three in your age group. 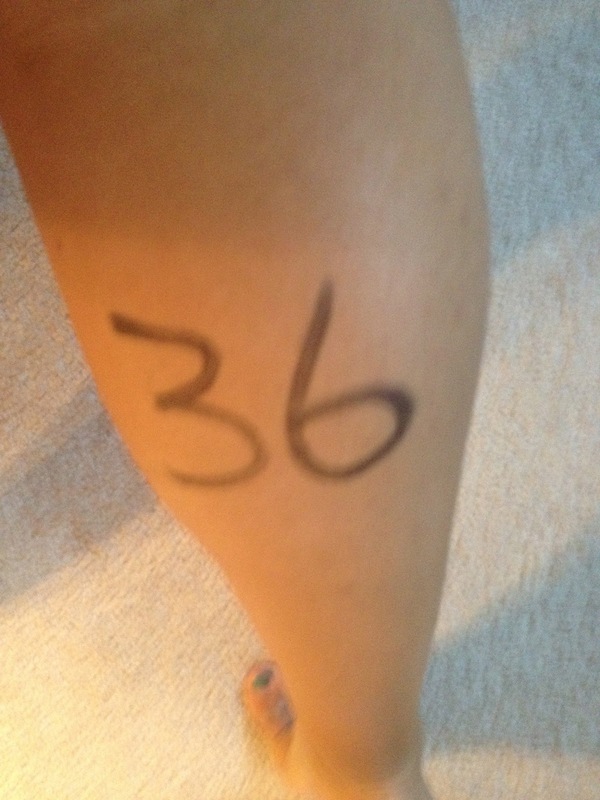 But in my last triathlon, I was zeroed in on the lady in front of me because she was 36, too. Even though I'm not bothered by showing off my age, training for triathlons has forced me out of my comfort zone in many ways. I'm not a strong swimmer or biker so I've had to overcome my discomfort - and sometimes my fear - to put in the training time and work on my weak spots. But a big motivator for me has been my kids. I frequently encourage them to try new activities that they consider "too hard." I have promised them they will feel better when they overcome their fears. I can't always help them but have to stand on the side and cheer. When it came to facing my fears about triathlons, they did the same for me. They were at the pool during many of my workouts, watching and telling me "great job!" They witnessed my first ride on my new bike. 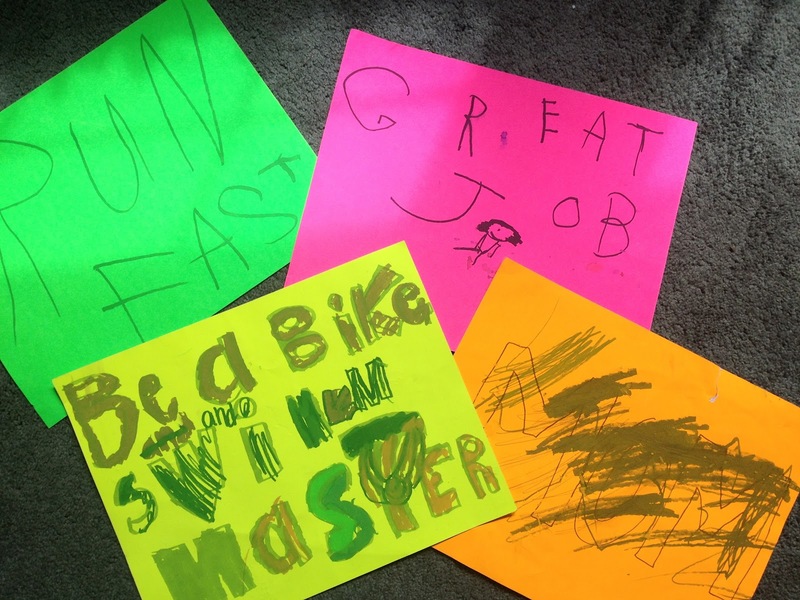 They made these awesome posters for me and cheered as I went "full speed" to the finish line. I felt like each event I completed made me stronger as an athlete and as a mom. I now call myself a triathlete without any qualifiers like "it was 13 years ago..." It's official. I've competed in three, I've won the Novice category at one triathlon and placed 2nd in my age group at another! I've jumped in a river and biked up some serious hills. I spend time thinking about reducing my transition time. I have gained a new aspect to my identity. It makes me curious who I will be when I'm 46! By then my kids could be competing in events with me...but I won't worry if they beat me. They're not in my age group! Where do you train for the swimming portion of the triathlon? I swam at Valley Brook Pool this summer - here's the link: http://www.valley-brook.org. I also had to squeeze more than one swim workout into tiny hotel pools. Not sure what I'll do this winter. If you are interested & need a private swim coach, I can't recommend anyone better than mine!